The original title of Key's poem was "Defence of Fort M'Henry." It was retrieved from the Poems of American Patriotism (1922), Brander Matthews, editor. The poem is featured in Patriotic Songs. [Sidenote: Sept. 14, 1814] After the British had burned the Capitol at Washington, in August, 1814, they retired to their ships, and on September 12th and 13th, they made an attack on Baltimore. This poem was written on the morning after the bombardment of Fort McHenry, while the author was a prisoner on the British fleet. 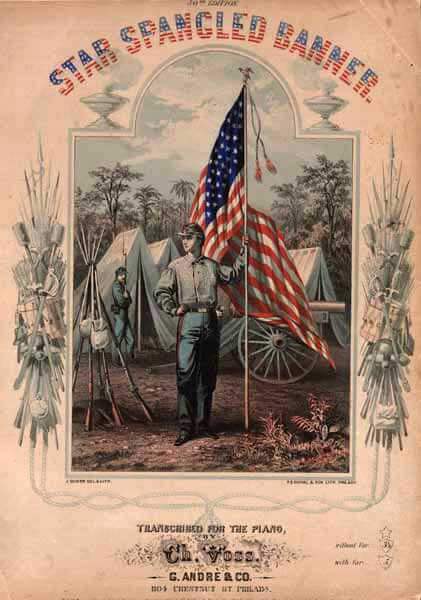 Featured in our collection of American Patriotic Songs. America - My Country, 'Tis of Thee (1892) was America's de facto national anthem until The Star-Spangled Banner was officially adopted in 1931. Add The Star-Spangled Banner to your own personal library.